The private spaceflight company OneSpace in China launched its first rocket, the OS-X, on May 17, 2018. It is China's first privately built rocket. China just took a big leap into the private-spaceflight game. 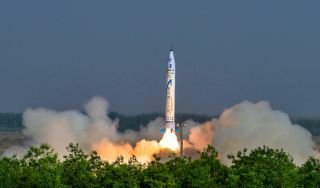 A rocket built by Beijing-based company OneSpace debuted Thursday (May 17), launching from a site in northwest China and reaching a maximum altitude of about 24 miles (39 kilometers), according to media reports. But OneSpace is also working on an orbital rocket known as the OS-M, which will launch satellites when it's up and running, China's state-run Xinhua news service reported. "Our focus is on the small-satellite market," said OneSpace founder and CEO Shu Chang, according to Xinhua. "Commercial rockets are relatively more efficient and cheaper," Shu added. "We see great potential." The OS-X rocket built by the Chinese company OneSpace reached a maximum altitude of 24 miles (39 kilometers) during its maiden flight on May 17, 2018. The company is building a larger vehicle, the OS-M, to launch satellites. China's government has long dominated the country's spaceflight program, notching a number of impressive successes over the past decade and a half. For example, the nation sent its first astronaut to space in 2003; put robotic probes into orbit around the moon in 2007 and 2010, and a rover on the lunar surface in 2013; and launched people to two different prototype space stations in Earth orbit a total of three times from 2012 to 2016. But Chinese officials have recently expressed a desire to expand the nation's spaceflight activities to the private sector, and in 2014, the government issued guidelines laying out how companies could get involved. A year later, Shu founded OneSpace. The startup is far from alone in targeting the small-sat launch market. A number of other companies — such as California-based Rocket Lab, Arizona's Vector Space Systems and Virgin Orbit, part of Sir Richard Branson's Virgin Group — are also developing relatively small and cost-effective boosters. OneSpace's plans and rapid progress have led some commenters to link the organization with the most famous private spaceflight company in the world, SpaceX. But Elon Musk's business already routinely launches big, high-value spacecraft — and lands and reuses the first stages of its large and powerful rockets. "Many compare us to SpaceX, but to be honest, the gap is more than a little," Shu told CNN.